Addams Family or The Munsters? Who would you consider your greatest style icon? Why did you want to make a movie about your life? Armen, when you first started out, and being so young, what was the biggest thing that made you want to challenge the “status-quo” ? 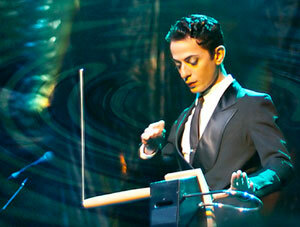 Hi Armen , it is obvious the theremin is one of the most important things in your life. Has there ever been a time in your life where you didn’t want to play the theremin anymore? And if you did , what did you do to keep on playing ? If allowed back into Iran, where would you go first? Why? Being from a Middle Eastern heritage are you out to your family and if so are they accepting of who you as a gay performer and also as I know you as a NY LEGEND ?